Scientists fear amphibian destruction will be disastrous, with many species disappearing uncatalogued. Frogs and other amphibians are being wiped out at such a rapid rate across Asia that many are going extinct before scientists even have a chance to identify them as new species, biologists warned at an international conservation meeting in South Korea this week. The scale of the destruction – caused by habitat loss, disease, pollution and other factors – is hard to quantify, but scientists fear the result will be disastrous. 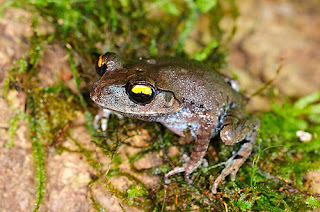 Amphibians have been suffering a wave of devastation all around the world, in part because of the spread of the fungal disease Batrachochytrium dendrobatidis, known as BD or chytrid fungus, which has wiped out whole populations within the space of a few years. But while conservation and monitoring efforts have so far focused on the Americas and Europe, little work has yet been done in the world's most populous continent, with the result that many amphibian species there are as yet uncatalogued and unstudied. For instance, according to one researcher, there are probably at least three to four times as many amphibian species in India alone as are currently catalogued. Frogs and other amphibians are among the most threatened creatures in the world today – globally, at least a third, probably 40%, of amphibian species are in urgent danger of extinction, making a total of more than 2,000 species of amphibian so far documented to be officially "threatened", "endangered" or "vulnerable", classifications used by scientists to describe the level of threat. "This is higher than any other terrestrial animal," said Jaime García-Moreno, executive director of the Amphibian Survival Alliance. The plight of frogs and other amphibians is of particular concern to scientists because many think the devastation afflicting them could be a foretaste of that in waiting for other creatures. Their physiognomy makes amphibians particularly sensitive to small changes in their environment, including temperature changes such as global warming, and to water and air pollution. This sensitivity, some scientists believe, could be behind the sudden and unexpected extinction of certain species even from well-protected areas. Waldman pointed to the golden toad of Costa Rica which "disappeared from a pristine habitat". Scientists could also learn more about the deadly chytrid disease from studying Asia, noted Mi-Sook Min, research professor at Seoul National University. Some indicators suggest the disease could even have come from the continent, as most cases to date have been found in other continents which may indicate a long history in Asia whereby amphibians have evolved to live with the disease. However, there are also indications in other research that the disease could have been existing in Latin America since the 1880s. The scientists, presenting their work at the World Conservation Congress, the quadrennial meeting of the International Union for Conservation of Nature, in Jeju this week, called for more research into amphibians in Asia as a matter of urgency.